Bjorn: It's up there, I have to say. But it's down to the players on the team. It's down to what they are as their personalities and what they want to achieve. You know, it's no secret we get together about this and we always have done. We went through a transition last time, and you know, in the team, and sometimes you go through that and that becomes difficult, and especially when you go away, this team was just a very, very solid team, and all of these guys that are here, they are quality golfers. They are putting their stamp on the world scene, and there are a couple on this team that are right on the way to the top of the game over the next few years, and they will be massive parts of these European teams in the future. It's a great group. 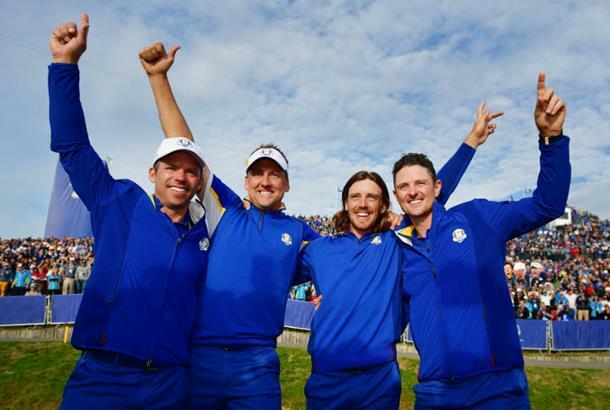 It's a group that believes in themselves and what they stand for, and they carry the torch on for what the European Ryder Cup teams is all about. They understand the history. They understand what we're about, and that's what will do them great going forward. Molinari: So much, so much more than majors, more than anything. You know, it's hard not to get emotional when you think about the other players, the vice captains, Thomas, the wives. It's been an incredible week. Obviously they had probably the strongest team ever and were just so good. Poulter: You know, this is a special team. There's a young bunch of kids. I was fortunate to get a pick as an old man to come and play, and you know what, I helped out a little bit and these boys were assembly incredible. To bring this trophy back, to keep that run going the way we have, you know, we're a strong force in Europe. We knew we were the underdogs and that made us even more determined this week. Fleetwood: I've spent time in a bubble this week with Ryder Cup legends and guys that are playing in it for the first time, and you know, it couldn't have gotten any better. This is it. This is as good as it gets right now. Rahm: To beat Tiger, one of the greatest, if not the greatest, on the Sunday, with a pivotal point, I was so aware of it, it's the best feeling of my life. Couldn't be happier that I helped the team. Bjorn: Yeah, that doesn't happen very often. You know, the whole team has been part of this. And I think it's very easy to sum it up: Some play five matches and some play two matches, but they all contribute, and when you sit in this situation at the end of it; you know, I've played in my Ryder Cups, and I don't care how many matches I play in as long as we win and I think that's what it's all about. I think we all feel that way now. We got it right this week. We worked as a team and we knew we were up against very strong opponents, but we went out on the golf course and believed in ourselves and what we stand for as a team. We never, ever looked towards their team about what they were about. We were about us as a team and what we do. This is the best team room I've ever been in. It was calm. It was determined. It was focused. It was fun. 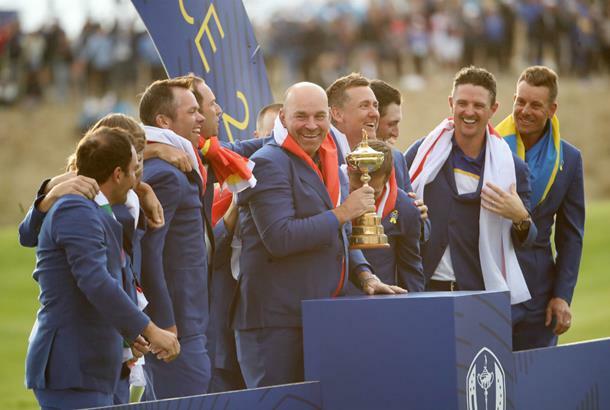 Everything that this Ryder Cup was, is what I think The Ryder Cup should be about for a European Team. Rory: I think as Thomas just said, the togetherness in the team room all week, we've all had this WhatsApp group going for awhile, which has sort of been just one big love-in. Garica: We even managed to get Rory on WhatsApp. McIlroy: I wasn't on WhatsApp before this week. Rose: Tommy Fleetwood scored four points on the WhatsApp group, too. McIlroy: That was a big part of it. We all get along so well. Thorbjørn was a little late to the party. He didn't sort of chime -- he had the mute. He didn't chime in for a while. McIlroy: He certainly arrived on Sunday. You know, I think there's just something about this group of guys; I think, for example, Ian and I sort of got word on, sort of Wednesday night, Thursday morning, that we were going to play foursomes together. But we've played together before, and we've been successful, or Ian's been successful and I've watched. 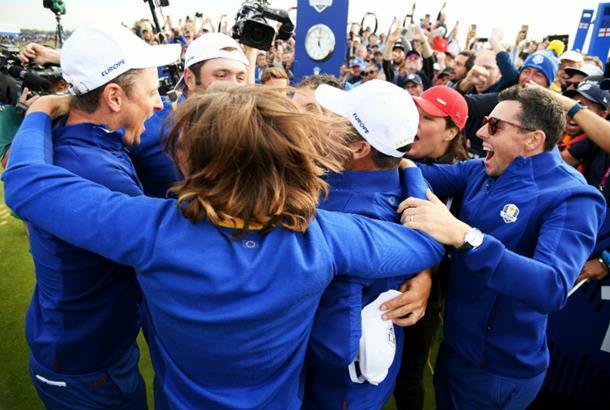 The togetherness of the team, the great camaraderie we have, that's built up on The European Tour, and obviously we all have our separate lives going on, but once we get together for The Ryder Cup, we all come together as one. You know, it was just such a good week. 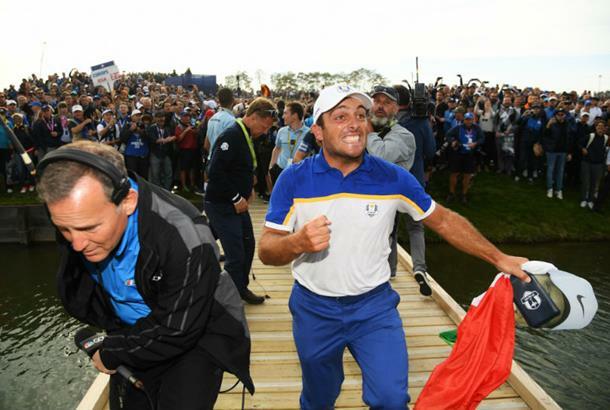 Molinari: I'm just so proud of every one of these guys. You can't even imagine. Every single one, you know, you could see on Monday when we got together, it wasn't ending up any other way. I've been part of another two winning teams where I didn't bring full points, and I'm glad after I've been carried on the shoulders by some of these guys to give something back. But it's about every one of these guys, the vice captains, it's just the best team I've ever been part of by miles. Poulter: He's allowed us to be very relaxed and chilled in the team room, and he understands every player on a personal level and professionally, as well. So to be able to have that level of calmness in the team room, I think this week showed through. Thomas has pulled his team together and I'm not including us 12 as a team, but the entire team behind the scenes to make all this work, and that's what's been very, very impressive. Rose: Thomas didn't fill our week with pointless team meetings. He trusted us to be 12 players that would come together, and today trusted us to be 12 individuals, like Rory said, sent a great message earlier, but 12 individuals working towards the same common goal. And that was his strength this week. And I think that we didn't drop our guard all week long. We stayed on point as a group, and everybody, the discipline that we showed got us to this point where we can now let our hair down and now really drop our guard hard. This team was relentless in its pursuit of excellence. We ticked every box we could control all week long, whether it be recovery, nutrition, practise rounds. Our focus was unbelievable this week. Garcia: I promised you three (points). I got you three. 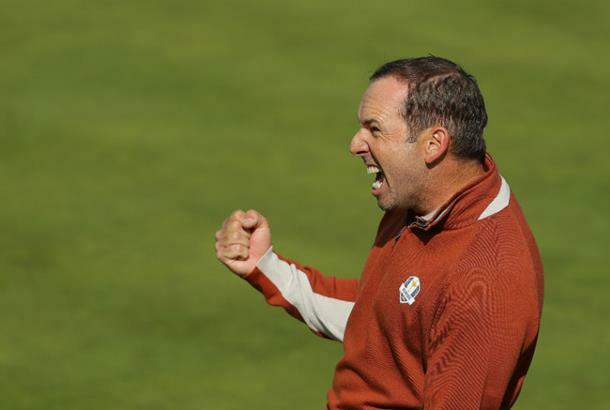 Bjorn: I think Sergio's Ryder Cup story tells its own -- it's a whole thing of its own, and it's a brilliant story. It's a fantastic achievement. He is very much the centre of what we do, and I've been saying this all the time: He walks into the room, he is right in the middle of everything. And you know, you've got to have great people that look at the team from the outside, but you've also got to have great people from the inside, and he's one of them. But all of these people understand each other. All of these guys can push each other forward. But Sergio's done amazing, and for Jon to go out in his first Ryder Cup single and beat Tiger Woods, you know, that's a pretty cool thing that you'll have for the rest of your life, and that's something that he will carry in his career, knowing that on the biggest stage, against the best player that's ever played, I can stand up and do great things. Well, I'm not very good at adding up but I'm sure if I put these numbers together, they make the difference in the score. I think I got it right, and so, you know, they have been fantastic. They bring more than they do -- I couldn't have dreamt of what they brought on the golf course. They have been fantastic this week on the golf course. But in the team room, you know, they bring the experience. They bring the understanding. It's those guys that last night sit and make sure that everybody's in the right frame of mind and they are ready to go out and play because they have done it so many times before. 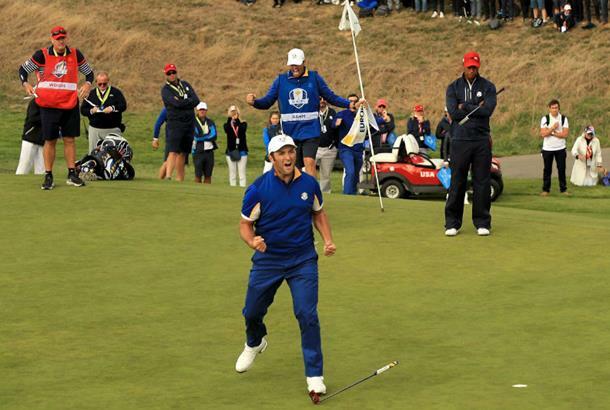 I think it takes to play in The Ryder Cup and being in a lot of team rooms and to understand what it's all about. Sometimes when you have some great new guys coming through where you've got to balance it out with experience; it worked well for us this week, it really has. When you take on the captaincy, you can never dream of a score line like this. You know it's going to be close, but you can't dream of a score line like this. That's obviously down to all 12 players, but I'm extremely proud of those four guys that got picked, because it's by no means easy to be picked. There's pressure on you if you're going to be picked, and they stood up, all of them this week, and showed what they are worth. You know, from Sergio and Ian that are such the heartbeat of what we do; Henrik that brings all the calmness, and then Paul, you know, you can only say, welcome back. Poulter: And we had an extra bit of motivation this week, as well. You might all see -- I don't know when it's going to get done, but we had some extra motivation this week to make sure we put our hands back on that trophy, as little or big as that number is going to be; it will be a very interesting number to see. Rose: Was it a number or an image? Garcia: We still have to work the initials of the players. Rose: I think they might be talking about a tat, to keep everyone in the loop. McIlroy: There could be a visit to a tattoo parlour coming soon for Mr. Bjørn on his head. Bjorn: Let me put it this way, it's going to go on a part that only Grace will see. I might have to send them a picture, well, then you'll all see it as well, I guess. (Laughter) the worst decision I made all week. Garcia: No, it was the best. Something to fight for, extra. Poulter: It was clearly the best.